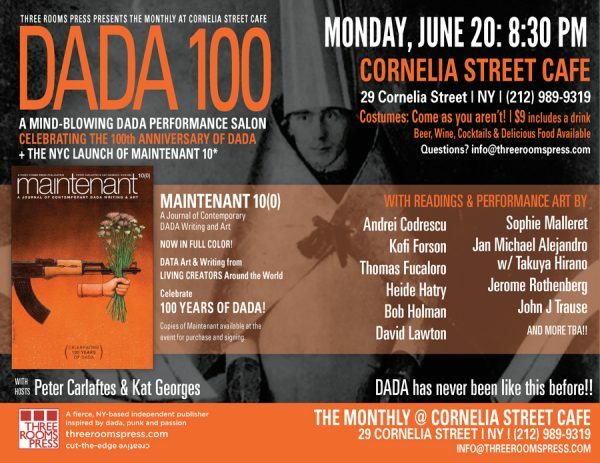 Prepare for an evening of disruptive, challenging and controversial art and writing as Three Rooms Press celebrates the 100th Anniversary of DADA with its ninth annual DADA salon at Cornelia Street Cafe, Monday, June 20, 8:30 pm. The event will feature performances by modern day Dadaists whose work continues the spirit of the avant garde art movement sprung from the horror of World War I. The event will also celebrate the launch of Maintenant 10: A Journal of Contemporary Dada Writing and Art, published annually since 2008 by Three Rooms Press. Doors open at 8:15. Admission is $9, which includes a free drink. Cornelia Street Cafe is at 29 Cornelia Street, in the West Village, between W. 4th Street at Bleecker (http://corneliastreecafe.com). Reservations and additional information: info@threeroomspress.com. The Dada Salon is the latest installment of The Monthly at Cornelia Street Cafe, a unique series curated by Three Rooms Press that brings together leading poets, intellectuals, performers and budding rebels on a different topic each month.